BULLETIN: On May 20, Guatemala’s highest court threw out Rios Montt’s conviction. Appeals are being filed. The packed courtroom was quiet for much of Judge Barrios’ reading. Then cries of “¡Justicia! ¡Justicia!” erupted when she pronounced the 80-year sentence and ordered Ríos Montt to begin serving it immediately. Antonioi Caba, an Ixil leader of the Mayan survivors’ group that first brought the case more than 10 years ago, wiped his eyes and said the sentence had “broken impunity and achieved justice,” reported the Times. Many other criminals who participated in the genocide and assisted Rios Montt were not convicted — and were not even present in the courtroom. Chief among these were U.S. CIA officials and several past U.S. presidents. The campaign of genocide against Mayan peoples killed more than 200,000 and was roundly condemned at the time. Two investigations, one by the Guatemalan Council of Catholic Bishops and another by the United Nations Human Rights Commission, excoriated the Rios Montt regime in Guatemala. Secret detailed CIA cables have come to light, which show that the U.S. government was fully aware of the atrocities and purposely suppressed this information for decades. Rios Montt had a long and bloody career as a U.S puppet. In 1951, at age 25, he attended the infamous School of the Americas then located in Panama. In 1954, he played a key role in the successful CIA-organized coup against the democratically elected president of Guatemala, Jacobo Arbenz Guzman. In 1970, under President General Carlof Manuel Arana Osorio’s military regime, Rios Montt became a brigadier general and chief of staff for the Guatemalan army. In March 1982, Rios Montt seized power in a bloody coup d’etat that was quietly backed by the CIA and the Reagan White House. He and his generals unleashed a scorched-earth attack on the nation’s Mayan population that, according to a U.N. commission, resulted in the annihilation of nearly 600 villages. As many as 1 million more Guatemalans, many of them Mayan peasants, were uprooted from their homes. Many of them were forced to live in concentration camps enclosed with barbed wire and patrolled by armed guards. Many were later forced to work in the fields of wealthy land barons. Rios Montt scorned charges that his scorched-earth policy violated human rights: “We don’t have a policy of scorched earth. 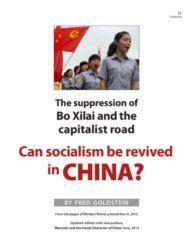 We have a policy of scorched Communists,” he sneered, the Dissident Voice reports. If not for the United States, Rios Montt would not have escaped justice until he was 86 years old. Progressives around the world must see to it that all of his many accomplices, including those culpable within the U.S., are also punished for their crimes.